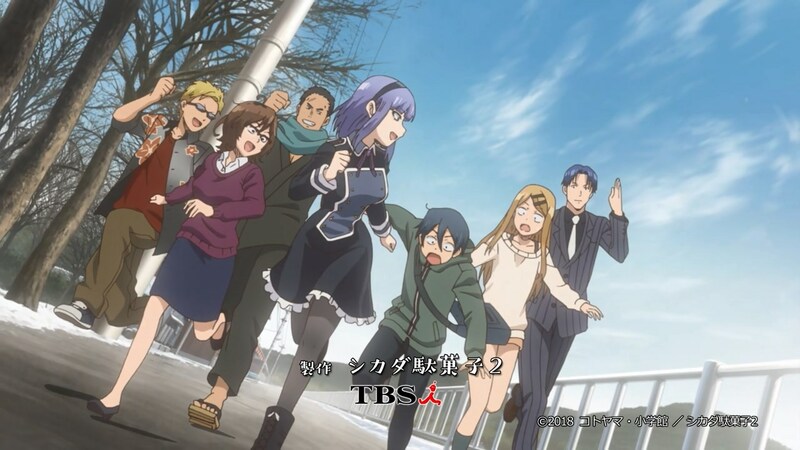 With Dagashi Kashi 2, the top-level takeaway is that, if you enjoyed the first season, you’ll pretty much enjoy the second season. The shorter run-time per episode even makes it a better watch-it-in-a-spare-few-minutes show, which means the requirements for each episode to be enjoyable are lower (much like a dagashi itself). Which is good because this season is an across the board downgrade from the first, even if it doesn’t descend so far as to be unenjoyable. One of the biggest changes (outside of the 12-min run-time, which is a relatively neutral change) is the art style. This season is much less visually pleasing than the first. I have to admit that I didn’t even really notice it at first (marginal animation differences aren’t at the top of my Stuff I Pay Attention To list), but as the season went on, I started to notice it more. Likely others noticed it a lot from the beginning. It’s not a deal-breaker—it’s not like comedies live or die on their luscious animation—but it is a downgrade. The other big change was the distinct lack of Hotaru. The first season had this issue too, and while I’m a big Saya fan, following up the unpopular sidelining of one of the main characters in the first season by rendering her completely absent for over half the second is perhaps not the best idea. I’d guess this happened in the source material as well, but the hard truth is that having her be gone for so long took the wind out of this season, even if some of the things that happened because she was gone were really fun. Here is where the half-length episodes might have really hurt the series; if Hotaru had been gone for three episodes instead of six, we would have gotten more Hotaru on the season, and maybe we could have actually explored all the fun stuff hinted at in the final episode instead of leaving it as a cliffhanger. I want to know more about Hotaru’s company! I want to see her relationship with her older brother Beniyutaka! I want to see her interact with Hajime! Guuuh. Speaking of, I really enjoyed the introduction of Hajime. Not only did Akasaki Chinatsu kill it in the role, but Hajime showed herself to be a really enticing mix of clumsy and insightful. I think she really proved why she’s in this cast when she correctly anticipated that Coconutsu would be depressed after his manga review session. She was also just a lot of fun, and added a great spritz of something new when the show most needed it (i.e. when there was no Hotaru). Beniyutaka was fine, honestly the best part of him was just hearing Sugita Tomokazu go to town, which is always a good time. His best parts are, I would guess, still to come vis-a-vis his competition for Coconutsu and his relationship with Hotaru. In the end, Dagashi Kashi 2 was fine. It lacked the luster of the first season, though the strength inherent in the source material kept it from completely falling apart. If it returned for a third season I’d definitely be hoping for something more like the first, because a further slide would seriously imperil the series as a whole. As is, this second season was fine. Not the best, but I didn’t regret watching any particular episode. I guess that will have to do. Really like Hotaru Shidare. In terms of appearance, in comparison to others like Louise de La Vallière or Aki Adagaki, she is the ideal heroine with her female body curves and well endowed chest; want to see more heroines like her, not sure where. Not to mention her personality also adds some nice flavor to her character that makes her likable since she isn’t one of those “I want to abuse the main character” type of heroine. Agreed, the lack of Hotaru and the incursion of Hajime gave Coconutsu a sense of purpose and responsability, he felt like a main character instead of a reactionary of Hotaru and Yo’s antics. My favourite parts were: Hotaru as a kid with in the old man’s Dagashi store, Saya realizing Hajime lives with Coconutsu, To as a bad guy, Monjiro Squids+Beer+Hajime, Fireworks with Coconutsu+Hotaru in ep 4, Hajime’s job interview. And the end song. Also, I would watch a GoldenBoy inspired anime with Hajime taking a different job every episode. Saya realizing Hajime lives with Coconutsu was great! Really just Saya and Hajime are both great. I think the shorter runtime was due to the show sharing a half hour timeslot with Takunomi. It was, but that was a decision made somewhere along the line, so it’s still fair game to talk about what if that hadn’t been the move. From what I’ve heard, the manga is ending soon-ish so a third season would be the final one and I would be happy with that. Overall, I agree with you Stilts. Not bad, but still a downgrade from season 1.